The FA Cup, founded way back in 1871, is the oldest football competition in the world and for many is the UK's greatest sporting contest. One of the wonderful elements of the FA Cup is that it gives obscure teams from the lower leagues the chance to knock out the titans of the game, such as Manchester United or Chelsea. And it does happen. With the FA Cup, you never quite know what's around the corner. The 2012/13 competition sees more than 750 teams battling it out over many months, with fans up and down the country hoping it'll be their club lifting the iconic trophy at Wembley Stadium on 11th May. As part of an initiative to bring the football competition closer to fans, the Football Association is taking the FA Cup Trophy Tour to various cities around the country from now until January. Fans can enjoy a cinematic presentation about the FA Cup past and present, discover everything there is to know about their favourite team's involvement in the contest, and even have their photo taken with the magnificent cup itself. But best of all, children aged 12 and under will have the chance to enter a unique competition. The prize? 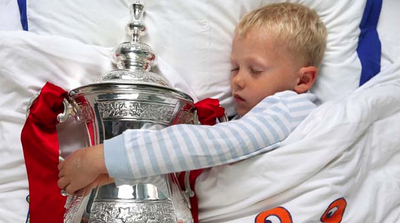 A sleepover with the FA Cup. Imagine, drifting off to sleep in your own bed clutching the FA Cup, a trophy held aloft at Wembley Stadium by some of the game's greats, such as Bobby Moore, David Beckham and Steven Gerrard. On the other hand, chances are you'll be so excited you won't sleep a wink. The FA Cup sleepover competition will take place just ahead of of the first, second, third and fourth round fixtures, played over the next three months. To enter, you just need to fill out a form at an FA Cup Trophy Tour venue – locations for the tour are dependent on how the FA Cup unfolds, so keep an eye on the FA's website for the latest news and information regarding the tour. Sir Trevor Brooking, the FA's director of development, said: "The FA Cup is one of the most recognisable pieces of silverware in world sport. No other football competition in the world matches non-League minnows against giants of the game." He added, "We hope that a new wave of football-mad youngsters can fall in love with the competition like generations of children before them." With a sleepover competition like this, you can bet the FA will have little trouble in achieving its aim. Why? The iconic cup competition is the stuff of dreams. When: 29th October to 20th January, 2013. 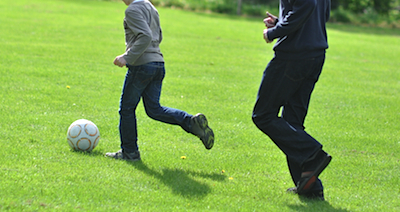 Where: See the Football Association's website for up-to-date information.